Fasika Waltengus, Programme Coordinator and working on HIV and AIDS at the YWCA of Ethiopia, took part in the panel of the World YWCA Satellite Session ‘Wanted: Comprehensive Solutions for All Women at the XVIII International AIDS Conference. Through her presentation, Fasika explores the meaning of Safe Space for women and girls. “All women define their ‘world’ in different ways. It is the private spaces of family in homes, bedrooms and kitchens. These intimate spaces should offer love, care, and support, as well as nurture the full potential of every person. Yet too often, these private spaces are where women and girls experience domestic violence, abuse or neglect. It is also the place where women and girls, often unknowingly contract HIV and other sexually transmitted infections. In my speech today, I want to look at the ways how we can create ‘safe spaces’ for women, young women and girls. But first let’s look at what safe space means? The notion of ‘being safe’ speaks to the enjoyment of universal human rights and being free from stigma and discrimination. It is about enabling women, especially young women, to make decisions about their lives, especially in relation to sexual and reproductive choices such as sexuality, decisions about marriage and the number and spacing of children. Creating ‘Safe Spaces’ can serve as a fundamental building block for women and girls’ empowerment activities. The YWCA in Ethiopia – an affiliate of the World YWCA, has engaged itself over the years in creating safe spaces for diverse groups of women regardless of age, ethnicity, social background and HIV status. These safe spaces are cross-cutting interventions, laced in to all the different projects. Let me share with you some of our history regarding women and girls in Ethiopia. The Ethiopian tradition turned its back on women a long time ago and this is still the situation. Most women in Ethiopia, as in most other African countries, are oppressed and denied a range of rights such as the right to education and employment opportunities, gender equality, economic security, self expression and social connection. All of this has caused vulnerability to HIV and other sexually transmitted infections. Most community women who are working and are preoccupied with domestic household choirs, that are labor intensive and this is almost always expected and a thankless job. I remember all the women in my family saying “A woman’s work is never done”. Thus, many women are subjected to become unpaid working moms in their homes. This often diminishes their self esteem as they lose incite to the outside world. In turn, this makes them even more vulnerable to being economic dependant on their partners. In the same way, girls suffer both physically and socio-economically from lack of safety, privacy, and self expression. From our work we have seen that young women and girls lack private spaces even in their homes as they try to deal with menstruation and sanitation secretly. So how can we create safe spaces? 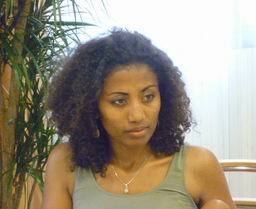 In the YWCA of Ethiopia we have been able to raise the voices of young women to make decisions about their lives. We have done this through creating leadership. We have developed leadership through female football teams, summer youth volunteers groups, peer educators, self help groups for women and university gender clubs that address reproductive choices and negotiation skills. This translates into more developed emotional intelligence and in effect, young women have more control over their own lives and are more effective leaders in their homes and in their communities. The perfect example of this would be our peer educators working in our HIV prevention program. These volunteering young women have proved to be better leaders in the eyes of their peers because of the knowledge they gained on life skills that enhanced their roles as young women leading change. The second way of creating safe spaces is to create opportunity for young women and girls to have friends. These would enable them to discuss challenges and opt for solutions. Having friends to talk to is something that many of us take for granted. The YWCA female footballers are one of the best examples. These footballers are vulnerable children most of whom are orphans, and bread winners for their families. These girls live in city slum areas, having nothing to look forward to and nothing that inspires them. Through the YWCA, these children formed a female football team. This sport provided a safe space to discuss openly and freely how to overcome peer pressure. As a result, the girls now utilize the sport to discuss serious life challenges. They have developed friendships which offer solidarity and support. Through the process, the girls have become assertive and created life goals and now have hope for a brighter future. The third strategy is building knowledge and awareness. In our work we see that young domestic house workers are migrating from rural parts of Ethiopia to escape early marriage. These young women who work in homes as domestic workers are controlled by their employees. I call these employees the ‘gate keepers’. We provide training opportunities with both the young women and the gate keeps separately to build their knowledge on violence, coercion, peer pressure and sanitation for the benefit of the young women that are employed. No one should stand in the way of someone’s growth and enjoyment of human rights. We see that often women oppress women because they don’t know any better. This training and dialogue has been beneficial in ensuring young women have informal education during the day creating a safe space where they come in groups and build a social network. The fourth way is to create safe spaces to ensure that young women and girls have female role models. Young women and girls are influenced by the people they are exposed to. We all need heroes to look up to and so do young women. We have done this through mentorship programs. The YWCA strongly promotes mentor-mentee match in most of its programmes. For instance, we link up urban secondary school students with university students in exchange programs organised for this purpose. This has showed increased motivation in their school attainment. I want to stress that the creation of safe spaces for women and girls is the least expensive intervention technique that can be used, but the most significant way to make positive contributions in the lives of everyone, especially the disadvantaged and underserved women and girls. Thank you for the inclusion of sexual orientation along with other issues for young women.